Last week I showed you the new cabinets. 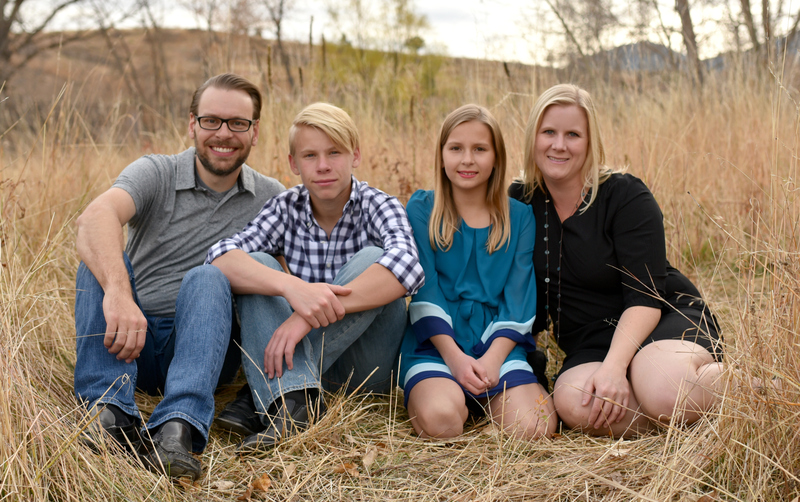 We love LOVE them and are so thrilled with how nice they turned out. As with any custom job though, there have been a few hiccups here and there. 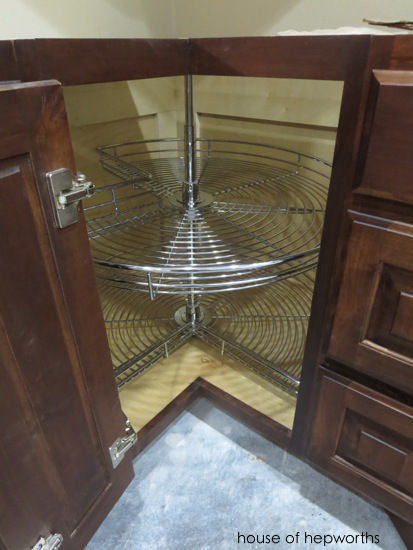 One of the biggest hiccups that brought the renovation to a halt was the Lazy Susan situation. 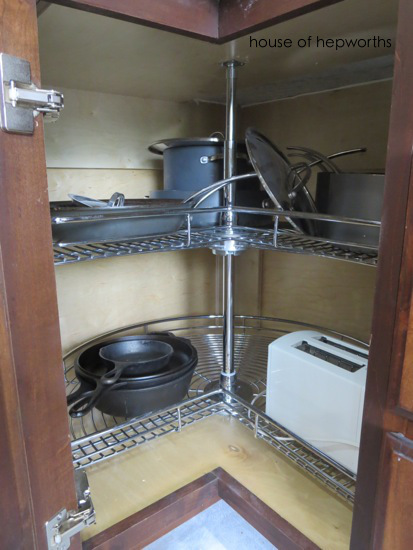 We have a Lazy Susan cabinet tucked in the corner behind the left pull-out spice drawer. We didn’t have a Lazy Susan in our previous cabinets and I really wanted one this go-round. It was a big womp-womp moment. 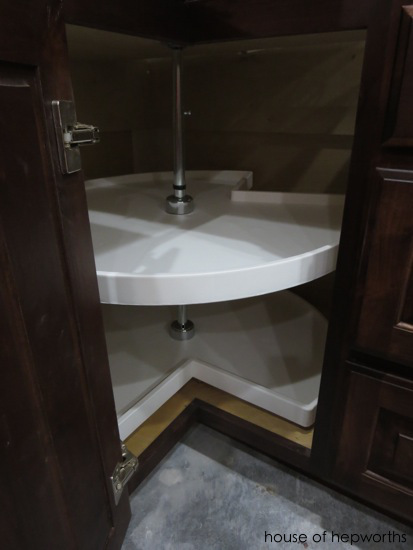 I assumed the Lazy Susan he’d pick out and install would be of excellent quality. It seemed logical that if you are paying for a custom upgraded kitchen you would receive a top-of-the-line built-in product as well. 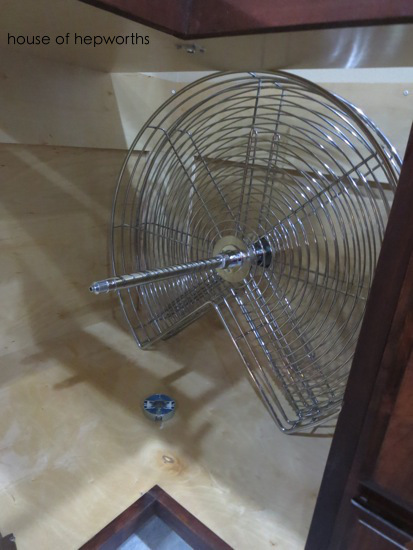 The main issue with this Lazy Susan is the fact that the plastic shelves are cheap and not sturdy. 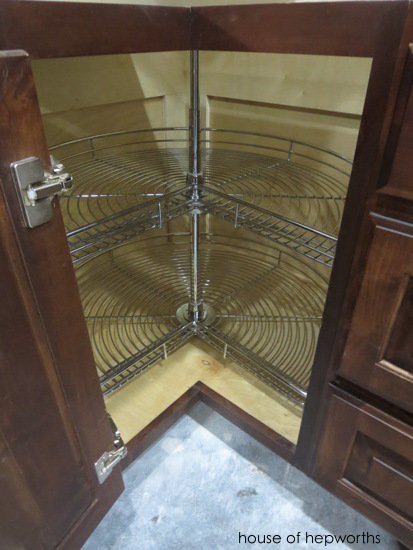 We could tell right away that any weight on the shelves would result in a Lazy Susan that was not functional. When pushed on at all the shelves would bow and the bottom one would hit the frame of the cabinet. Ben suggested it could just be our tupperware cabinet. I suggested we swap it out for a big sturdy one so I could actually USE the cabinet. It was an additional expense we hadn’t budgeted for, but we knew it was now or never. 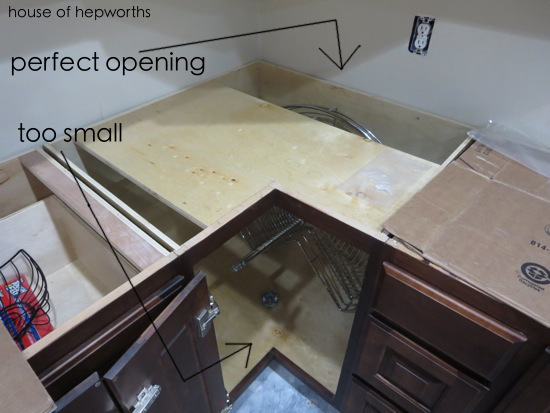 The problem with swapping it out later is that the actual shelves were too tall to fit through the opening of the cabinet, so to swap it out for a new one we had to install from the top of the cabinet BEFORE the counters went in. There was a hole just big enough on top to remove the old shelves and insert the new ones. 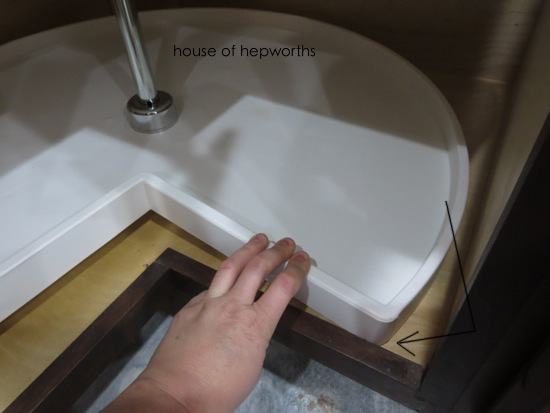 However, it would involve assembling the new Lazy Susan inside the cabinet after all the pieces were inserted into the cabinet. After a lot of research we decided to go with our new favorite organizing brand, Rev-A-Shelf. The easiest places to purchase Rev-A-Shelf products are from their website (the most expensive option), Amazon or your local hardware store. 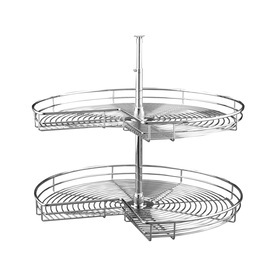 We opted for the most durable option, the Chrome Lazy Susan, priced after tax and shipping at around $250 (as opposed to the cheap plastic off-brand at around $50 – $60 that was installed initially). After waiting more than a week for the new Susan to arrive, it was FINALLY time to install it and get this renovation moving again. I disassembled the old one from inside the cabinet and pulled it out the opening in the top of the cabinet then inserted the two new shelves into the cabinet and started assembling. It was actually a fairly quick project, though the directions that came with the new Lazy Susan left much to the imagination. We now have a sturdy Lazy Susan that should stand the test of time. We are planning on having these cabinets and countertops indefinitely, so this new Susan better last for the next 50 years! Here it is haphazardly loaded up with pots, pans, and cast iron – probably the three heaviest kitchen-related products I could have loaded it up with. The Susan didn’t bow at all. Worth.Every.Penny. I guess my suggestion would be, if you are doing a renovation and unexpected things come up, decide if it can wait or if it has to be done right.this.second. The Lazy Susan had to be done right.this.second because there is no way to swap it out after the counters are on. We are waiting on a few other items though because we are already over budget and those things aren’t urgent – under-cabinet lighting, a tiled backsplash, and possibly even the pendant lighting for over the island. The Lazy Susan was a now-or-never scenario though. They say to budget about 20% extra for any renovation for when unexpected things inevitability pop up. We are using that buffer for items that are imperative that we handle now. Anyway, that’s the deal with our new Lazy Susan and yet another reason I am now obsessed with the awesomeness that is Rev-A-Shelf. They seriously are the best brand I’ve found for organizing cabinets (and NO, this is NOT a *sponsored post). « Cabinets! We have lots and lots of cabinets!! I have that Lazy Susan! I love it! Your cabinets look amazing!!! I have been whining to my hubby about our cheap plastic lazy susan for years now. Our IS the tupperware holder. Such a waste of space. I told him to just remove it and put some shelves in there. I really dislike the plastic one too. Your kitchen is really coming together. Love that lazy susan!!! As a woman named Susan who has endured countless “lazy Susan” jokes my whole life (some of them merited…), this whole post just cracked me up. We have the plastic one and it seems to do just fine with our glass casseroles and small appliances, but I do like the look of the chrome. We did our kitchen with Ikea cabinets last spring, and my corner cabinet lazy susans (one on the bottom, one in the top corner cab) are fantastic. The top one is glass and holds all my honeys, vinegars, things in glass jars. That baby’s not going anywhere, even with a couple dozen glass bottles. The bottom cabinet holds all my pots and pans, including a boatload of Le Creuset, and it doesn’t have any problems at all. I appreciate the non-sponsored posts. Some of my old favorite blogs are now filled with sponsored posts and they are just plain boring to me to read. I get that bloggers need to get some compensation for the time they put into their blog but sponsored posts really irritate me. You are right, I do value your real opinion! When we bought our house, it had the cheap, plastic lazy Susan already. I use it for my plastic storage, but being able to use it for pots and pans would be preferred. Someday we’ll do a kitchen makeover. **sigh** Yours is coming along beautifully. 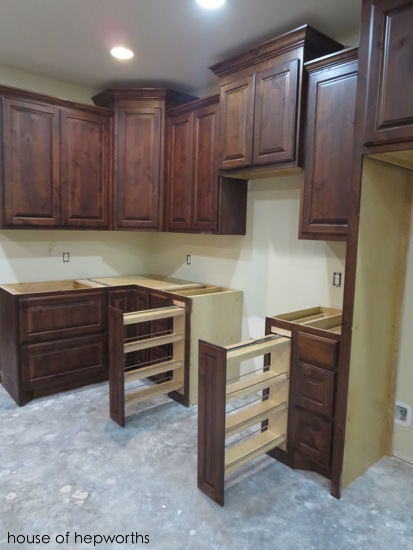 I am so happy for you that you were able to get custom cabinets and arrange your kitchen in a way that works best for you and your family. It can really make the difference between loving or hating cooking! When we built our house I was able to design my own kitchen layout and cabinets, and now I love spending time in the kitchen! Is that crazy? I am stuck with under-cabinet lighting that requires expensive and hard-to-find bulbs. When some of the original bulbs burned out, I could not find the bulbs anywhere except at the lighting company where I had purchased all of the lights for my house. They had trouble finding the correct bulbs, and when they did find and order them, it cost over $50 for 6 bulbs. At first I thought that might not be so bad if they lasted a long time, but, no, they burned out very quickly, and I cannot afford to replace them at this time. The reason I tell you all of this is so that you can inquire about the cost and availability of replacement bulbs when you get ready to choose your under-cabinet lighting. Good luck! Undercabinet lighting is not something I would wait on. It’s a huge hassle to get installed later because they have to run additional electrical and all that jazz. So much easier to just go ahead and do it while your house is being built. Allison, your creativity and practical perspective are amazing. You understand the balance between what looks great and what adds value and function. You know I think you are amazing. Like to see the indoor after finishing! I only follow two blogs religiously and after reading about your wait on a back splash due to budget I thought I would share the other one with you. She paints back splashes for much less and much faster than a tiled one would take. The link is to her tutorial on how to and to her business website galley for inspiration and ideas. PS- I do not know the blogger, so I promise this isn’t sponsored in any way. I just love both of y’alls blogs and thought I would introduce you, if you haven’t met already. I have a very similar chrome lazy Susan (if not the exact same one) and I hate it! Any heavy things on the top shelf cause the entire shelf to slide down the pole, even after much tightening of screws. Have you experienced this problem?